This versatile dual temperature heat gun is the ideal tool for stripping paint and varnish, removing decals, shrinking wire wraps, loosening fittings, thawing pipes and more! The heat gun features two heat settings to accommodate a wide variety of jobs and a superior coil design that heats materials more quickly than other heat guns on the market. This durable heat gun is great for both occasional use by the do-it-yourselfer and everyday jobs by the professional contractor. 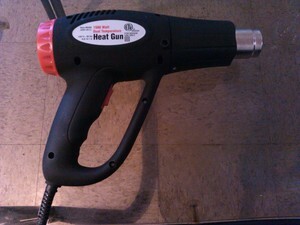 Superior coil design heats more quickly and maintains even temperature 572 degrees Fahrenheit low and 1112 degrees Fahrenheit high Durable ABS gun body Three-way switch Specifications Name	1500 Watt Dual Temperature Heat Gun (572°/1112°) SKU	96289 Brand	Drill Master Cord length	6 ft.